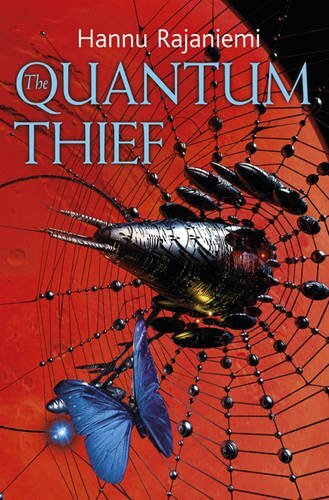 Anybody with more than a passing interest in literary SF will be aware of Finnish mathematician, Hannu Rajaniemi’s début novel The Quantum Thief. Long trailed as a masterpiece, it’s fair to say that there this novel has great deal of expectation to live up to. I sometimes have a problem with hyperbolic praise being heaped upon début novels – though I understand it. It is always a good experience to discover a new voice. However, I do sometimes worry that overstating the greatness of an authors early work can leave them with little room to grow. That’s not to say that there aren’t some writers whose first work genuinely is their best (Joseph Heller springs to mind, though Catch 22 is, of course, a masterpiece). I do tend to feel, though, that in general writing is a skill to develop. This is deeply unscientific, yes, but my impression is that most of the writers I enjoy who have a fairly substantial body of work have improved as they’ve written more. I think it’s a question of degree – things can be good, even excellent, without having to be the best thing evar. Anyway, point about all this is that The Quantum Thief is a genuinely astonishing novel. It’s all the more remarkable when you consider that English isn’t the authors first language. Whilst he’s not quite up there with Nabakov, I think he does display a similarly impressive mastery of a language that isn’t his first. “As always, before the warmind and I shoot each other, I try to make small talk. I don’t even know if it can hear me. It has no visible auditory organs, just eyes, human eyes, hundreds of them, in the ends of stalks that radiate from its body like some exotic fruit. It hovers on the other side of the glowing line that separates our cells. The huge silver Colt would look ridiculous in the grip of its twiglike manipulator limbs if it hadn’t already shot me with it fourteen thousand times. The novels opening sees Jean le Flambeur (whose name kept reminding me that I should probably watch some of Jean-Pierre Melville’s films again) imprisoned, forced into the iterated prisoner’s dilemma. Being a mathematician, the author handles this section deftly. The only problem is that he doesn’t really make any concessions to the reader. If you aren’t a scientist (or a voracious reader of SF) yourself, this part may be off-putting. A less brave writer may have been tempted to fall back some info-dumping to make things a little clearer, but it’s to his credit that Rajaniemi has resisted that. As great as I thought this novel was, though, I do think that were I attempting to convince somebody to try SF, this probably wouldn’t be top of the list. One other potential barrier to entry for a lot of readers is the quantity of unexplained neologisms in the text. They didn’t particularly bother me, but I’ve been reading SF for a long time, so I probably have some kind of immunity. That said, they never feel gratuitous (certainly not to the extent of becoming “annoylogisms“) and their inclusion felt entirely justified; the meaning for any invented (or just unusual) terms clear from the context in which they were used. Once you’ve been reading for a while though, although the style doesn’t alter drastically, your head will stop spinning and you can stop being impressed at the audacity of the writer and start to enjoy the more thrilling aspects of the novel. I think that this was, for me, a little after Jean le Flambeur is freed from his prison (it’s fair to say that this isn’t a huge spoiler – the novel would have been a little dull if he’d remained in prison repeating the prisoner’s dilemma on an infinite loop with only his thoughts and regrets for company). The far-future setting of this novel is, naturally, full of high technology – AIs, nano tech and the like. Of course, world-building and technical innovation by themselves aren’t sufficient ingredients in fiction, even a hard SF thriller, such as this. Rajaniemi understands that there needs to be some kind of human dimension to the tale. This is largely achieved. The Oubliette (a city, permanently in motion on Mars) is, of course an incredibly SFnal conceit (as I’m writing this, actually, I’m reminded of the moving city in Christopher Priest’s Inverted World, though I have to confess that wasn’t a connection that I made whilst reading the novel). What is more interesting is the society sketched in the novel by Rajaniemi. The inhabitants of the Oubliette have a fascinating social structure – time there is currency – and though they are able, should they wish to reveal anything about themselves. They can, if they wish, reveal nothing – this extends beyond our more limited current concerns about online privacy. The idea of the “Guevelot” (the method they use to obscure information about themselves) is both an interesting innovation and a timely comment upon the ideas of personal space and privacy. For all the attention that I’ve given to the scientific plausibility (and I do realise that as a scientific layman I may be indulging myself a little too much with misplaced appeals to authority in suggesting that the coherence and truth of the use of game and quantum theory within this novel is down to Rajaniemi’s scientific background) his handling of the future from a sociological perspective, whilst maybe not on a par with Ursula Le Guin (though for that kind of thing in SF nobody is – and it’s probably not so central as in her work), is impressive. The novel, as the title would suggest (as would the name of the character imprisoned at the outset of the story), is a heist novel. Jean Le Flambeur is freed in order that he can, as the parlance goes, do a job. In keeping with the rest of the novel, this is an extremely complicated job, and he finds himself embroiled in something larger than he had initially expected. Fortunately, Rajaniemi’s flair for language isn’t his only attribute, the pacing of the novel and tightness of the plot all help to sustain interest (and are more than an adequate pay off for the work that he makes the reader do at the start). For what is actually quite a short novel (by some standards anyway), I’ve only mentioned a fraction of the material within. This is a book chock full of great ideas, characters and intelligent to boot. I can only hope that he maintains the standards he has set himself here. The front cover has a blurb from Charles Stross suggesting that Rajaniemi is better at this type of SF that he. Unfortunately the only Stross that I can think that I’ve read is the short story Lobsters. I liked it well enough, but haven’t gotten around to any of his other work yet. That said, I have read enough of his blog postings and about his writing to give an idea of his preoccupations; I think that it’s probably fair to say that there are similarities between the two authors – though I’m far less qualified to comment on who has the better writing style. I only mention it given that Stross is well-enough regarded and known that it may give a little further context to the novel. An excellent, inventive and well-written piece of hard SF. Highly recommended. This entry was posted in Review and tagged finland, hannu rajaniemi, novel, sf. Bookmark the permalink. At last some ratanoility in our little debate.